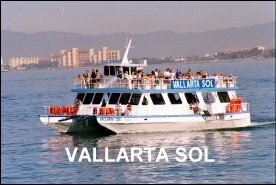 Get ready for a fun-filled day aboard the Vallarta Sol with OPEN BAR all day. Drinks include your choice of Corona Beer, Margaritas, Bloody Mary, Rum Punch, Tequila Sunrise, or Screwdrivers. Non-alcoholic choices of Sodas, Juice, Purified Water or Fruit Punch also available. All-you-can-eat Continental Breakfast is served upon boarding as you cruise the coastline of Vallarta. Pile your plate with sweet rolls, pastries and fresh fruit along with juice or coffee (or maybe a Bloody Mary or Screwdriver). Your first stop will be at the famous Los Arcos Underground National Park where you will be furnished mask, snorkel & lifejacket to explore the beautiful undersea marine life and colorful coral. The snorkeling should work up your appetite for your next stop including lunch at Las Animas Beach, a charming private beach only accessible by boat. You can swim, parasail, have your photo taken with the local iguana, hike or just relax in the sun or shade. Enjoy a leisurely lunch with your choice of grilled fish, broiled chicken, burritos, hamburgers, grilled meat or quesadillas. All food is included with your tour. You'll have the opportunity of negotiating with the vendors who will bring you a large selection of silver, blankets, beach wear and souvenir items. You will get to meet the "pie lady" and purchase her delicious homemade pies by the piece or whole pie: cream cheese, banana, lemon, apple and even pecan. Back to the cruise boat for more fun and a short cruise to Quimixto, a typical fishing village. The main attraction here is the inland waterfall. Rent a horse or hike through the lush jungle to reach this beautiful oasis. Swim in the cool, fresh water and discover the waterfront restaurant where you can buy snacks, refreshments or cocktails. On your return to the cruise boat, THE PARTY IS JUST STARTING. Music, dancing and games hosted by your Captain & Crew continue the fun as you leisurely cruise across the bay. The Vallarta Sol is fully licensed for Whale Watching when the humpback whales frolic in the bay between mid-November and mid-March. ENJOY ALL THIS! AND MUCH MORE! Daily Departures: 10:00 a.m. with return at approximately 6:00 p.m.
Cruise Vallarta is not responsible for personal items. Please safeguard your valuables. "I just returned from my trip to the Mexican Riveria via the Carnival Pride. We stopped in three ports altogether and because of your cruise that my sister and I went on we had the best time in Puerto Vallarta. Everything from the crew to the stop at Quiximo and the horseback ride up to the waterfall was fantastic. 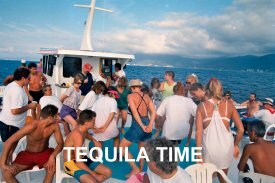 If I talk to anybody who will be in PV i would definitely recommend your Booze Cruise. Thanks again for the great experience." WE LOOK FORWARD TO CREATING THE MOST MEMORABLE DAY OF YOUR VACATION!